Some of the current and recent custom knife sheath and hand made leather projects here at the Woodlander workshop. 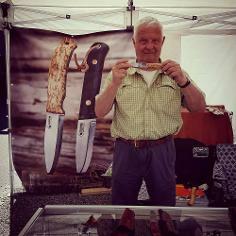 If you are looking for a custom leather sheath for your own knife send me the details via the Contact Us page. If I don't own a pattern version already then I usually require your knife to ensure I get an exact fit. I then return the knife together with your completed sheath. Current lead time is about two weeks in the workshop. Created for a customer's BK2, this Raven Molle sheath has an integrated DC3 pouch designed to tilt forward for easy extraction of the sharpening stone. The dark brown finish has been accented with black to complement the knife colour. This Raven sheath was made for a customer's TOPS TFK. The unique properties of the Raven design allow the knife to be inserted either way round so this Molle version can be worn vertically either left or right and horizontally too. Another Raven Molle this time for a Fallkniven NL3 knife. This simple version again can be carried either right hand scout or vertically either right or left hand. Created for a customer in Canada, this Raptor 3 was configured primarily for vertical carry, reorienting the pouch and firesteel to suit. Molle straps were also added to allow the sheath to be fixed to a backpack or worn horizontally. This scabbard was recently created for a customer's superb replica of a 4th century Celtic sword. The design was kept fairly simple with no tooled embellishments - in keeping with the period. A matching belt was also made using a hand-forged buckle. The leather was dyed and given an aged appearance before finally adding a coat of neatsfoot oil. This dagger sheath was recently made for an OKC Marine Raider knife. As the knife is a modern take on the traditional Bowie design, the sheath needed to reflect this. The sheath's traditional Bowie shape and friction fit were further enhanced with a tan colour dye and tooled border, giving a slight 'western' feel. A black accent was added to the edges to complement the modern knife handle colour. 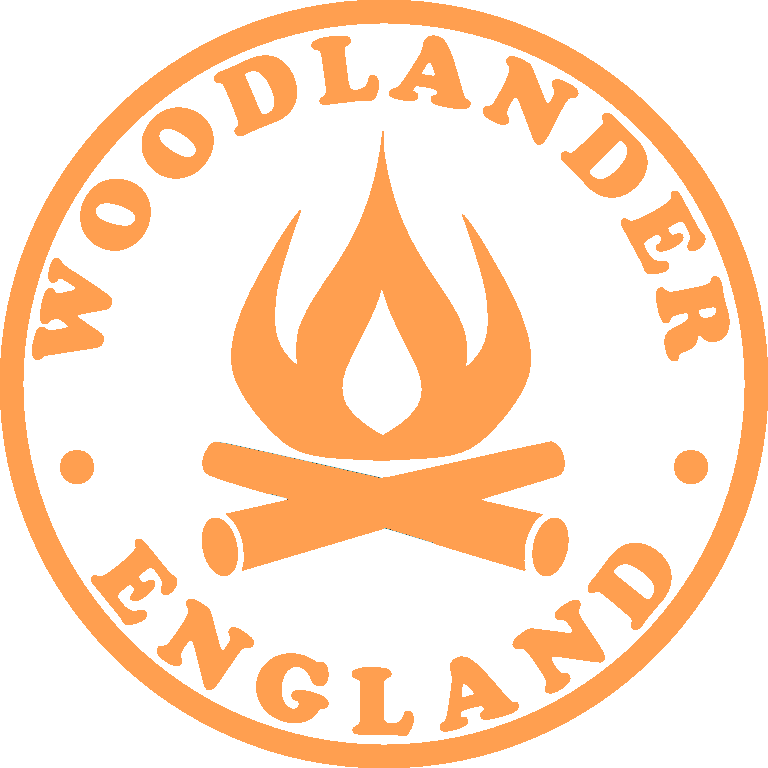 Finally a combination of beeswax and leather oil was used to proof the leather. These sheaths were created for a Jimmy Lile 'First Blood' knife. A replica knife was used to make the initial pattern as the original knife was too valuable to risk posting. The design follows Lile's original shape using supplied dimensions, however these sheaths have been dyed in a darker tone with black accent as per the customer's instruction. I chose a natural shade for stitching and finished them off with a traditional combination of leather oil and beeswax. On receipt, the customer kindly sent me his picture of the sheath together with the original Lile knife. A customer ordered this new Raptor 3 sheath in dark brown for his Lars Falt bushcraft knife after his original Casstrom sheath was damaged. The sheath has a matching firesteel, added belt loop for vertical carry and the usual pouch for tinder or a DC3 stone. 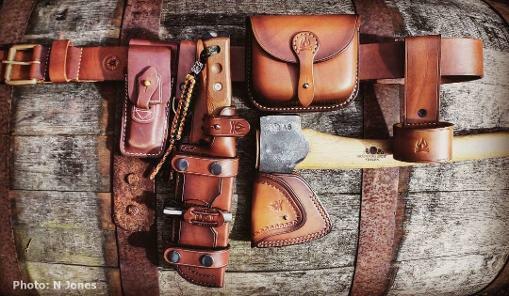 These items were created for a customer's bushcraft belt kit and include Bushbelt, Scout sheath with VC rig for TOPS BOB knife, Prospector pouch, Gransfors Small Forest axe sheath and axe dropper, all finished in dark tan. 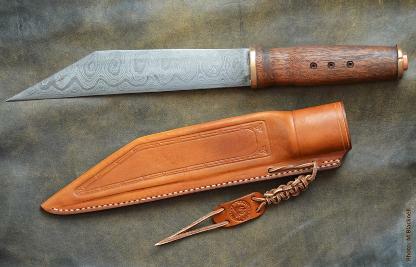 This unusual Russian puukko knife with damascus steel blade was treated to a new sheath and leather lanyard. The customer particularly requested a Russian style pouch sheath and opted for a small, braided strap attachment to secure the lanyard as a safety feature. Tooling was applied to replicate the pattern in the knife handle and Nordic rune symbols were also added. Finally a two tone colour scheme was used to create an aged effect. This Raptor 3 sheath for a curly birch TBS Boarwas modified to include a larger pouch for a DC4 sharpening stone and was also fitted with a removable VC rig for vertical belt carry. This basic left hand Scout sheath was made for the excellent Bark River Bravo knife. Finished in dark brown. This sheath was created for Spartan Precision Components for their latest hunting knife. It features a utility pouch with a small storage tin together with a ferro rod. The knife itself is made in Sweden by Casstrom. Decided to create some new pouch sheaths to be worn around the neck on a lanyard. The new Bushcrafter sheath has a repositioned firesteel holder to the front and custom tooling for a unique look. It also retains the bowed belt loop for conventional belt carry. This custom dagger sheath was created for a Strider Dive Tool. The customer specified a tan finish and requested the design to be either horizontal or vertical carry. These sheaths were produced for Spartan Precision Equipment, creators of the famous Javelin bipod range, for a set of twenty limited edition knives. The brief was for a horizontal carry sheath that would house the majority of the handle, have a small pouch for tinder together with a firesteel loop. The pouch bears the Spartan logo and the handle retaining strap can rotate to clear the sharp edge of the blade. 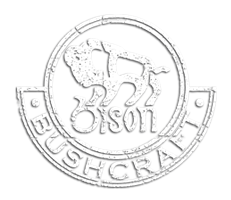 The knives themselves were made by Roger Harrington of Bison Bushcraft and are among the sharpest I have yet encountered. This sheath was recently created for a customer's Ka Bar knife and the design had to include a pouch for DC4 stone and a firesteel holder. I opted for a similar style to my Forester sheath but dispensed with the Molle belt loops in favour of a Tek Lok clip. The sheath also has the option to be carried vertically by means of a removable dangler loop and the pouch can be accessed from either end for convenience. I used a dark brown finish accented with black to match the knife handle. This folded dagger sheath was created for a customer's Buck Vanguard knife. The customer specified a basket weave pattern to give it an 'old west' feel. A dark brown finish was used accented with a dark chocolate colour to complement the wood grain handle. This dagger sheath in Paleo was created for a customer's ESEE 5. A simple dagger sheath was specified but with custom tooling to suggest a reptile scale pattern. The retaining strap was designed to rotate away from the cutting edge during use. This customer required a bespoke sheath for his customised Fallkniven F1 knife. The knife itself has contoured oak handles which are much more ergonomic than the standard ones. This bespoke sheath was loosely based on my Raptor design but modified to permanent vertical carry and a larger custom pouch was added. Pioneer sheath designed for the ESEE RB3 knife and featuring the secure firesteel holder is currently being tested with versions for the ESEE 5, 6 and TOPS BOB due soon too. The Pioneer sheath was a good choice for this TOPS Scandi Trekker knife due the the very slender handle. The Pioneer's Kydex liner can be moulded to obtain a strong secure grip without the need for a retaining strap. This Becker BK7 was treated to a custom Boreal EDC sheath. The pouch contains the usual storage tin and the dark brown leather was accented with black to complement the knife handle colour. This sheath was created for a customer's replica broken back seax knife, exquisitely made with bronze bolsters and deer antler handle. The sheath was kept fairly plain with a simple cross-hatch pattern to mirror the design on the bolster and braided belt loops were used to suspend the sheath. A sinew coloured thread was chosen and roughly hand stitched to give it a tenth-century handmade feel. This scabbard was created for a customer's replica 8th century Viking long sword which he forged himself. The wooden core was sheathed with a lightweight leather and dyed to give the piece an aged appearance and the heavyweight belting was added using a traditional laced construction. This Habilis Pathfinder Trade Knife arrived with a fairly basic pouch sheath that was a little loose fitting. This rustic working knife deserved something better so it has been treated to a new Scout sheath in dark brown. This custom Raptor sheath was created for a customer's Fallkniven NL4 knife and is based on my F1 Raptor Original sheath but with the addition of an optional vertical carry rig. This VC rig is intended for those who prefer to carry their sheath in a conventional vertical manner rather than horizontally. 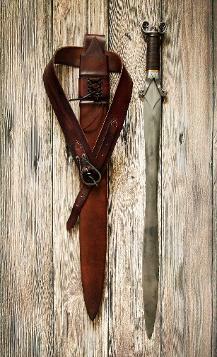 This neck sheath was recently created for a customer's Viking dagger. It was constructed in a traditional way with no welt and a simple Celtic pattern was embossed to the front panel. Several tones of dye were layered to create the aged appearance and a simple leather thong serves as a neck tie. 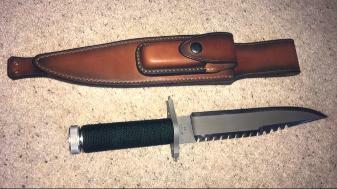 The standard Scout sheath pattern was modified to accept this Camillus Bushcrafter knife. Finished in dark brown. This customer requested a Bushmaster sheath for his ESEE 6 but specified a vertical carry. The Bushmaster is a large sheath so I created a heavyweight vertical carry rig which can be removed if required. This sheath was created by moulding the leather around the contours of the knife to obtain a good fit. It has been finished in paleo to complement the curly birch handle scales. This Dagger sheath for an ESEE 5 was given a subtle two-tone effect by first dying in dark tan then applying an accent colour of dark brown. This Boreal sheath was created for a customer in Australia who specified the paleo finish which is a good match for this ESEE 4 in desert tan. This new Boreal sheath for ESEE 6 has been added to my standard range and an ESEE 5 version will follow. A DC3 stone pouch has been added and the firesteel holder has been relocated to allow the belt loops to be set wider as on my regular scout sheath. This gives better balance for long blade knives such as this and is Molle compatible. This left hand pouch sheath was made for a customer's TBS Grizzly knife and features a firesteel holder and wide belt loop. The heavyweight leather has been dyed to complement the handle colour anddouble stitched to tame this beast of a knife. This customer requested two similar sheaths for his Ratmandu knife, one in dark tan, the other in paleo. The brief was to keep the sheaths simple with no pouch or firesteel loop and with a snap fastener to secure the knife. Maybe sometimes less-is-more. I made a slight modification to my basic Boreal sheath pattern for this Buck Vanguard knife. The sheath is the usual spec with firesteel loop and DC3 sharpening stone pouch. The knife has a 4.25 inch stainless steel hollow ground blade with Buck's Heritage Walnut Dymondwood handle. This customer requested several items to take on a trip to Lapland including this pouch sheath with dangler for his TBS Boar knife. All the items were given a veryrustic paleo finish. Pictured: Pouch sheath, Bush belt, Prospector pouch and Laplander saw case. Every so often I get an unusual custom request like this sheath for a customer's Viking Seax knife. I really wanted to recreate a traditional Viking style sheath and as I did not have access to the knife itself, I first had to create a mock-up from perspex and wood using the supplied dimensions. From here I could wet form a single piece of leather, bending it to the angle of the blade and clamping it up to dry. I added some subtle tooling to give the sheath an early medieval feel and finished with oil and beeswax, finally adding a simple braided leather lanyard to complete the piece. This sheath was created recently for a jungle knife. The customer preferred a custom Boreal style scout sheath with no pouches or firesteel loop and opted for the dark brown finish. This customer requested a Raptor style sheath for his ESEE 4 knife instead of my usual Boreal sheath as he preferred the horizontal orientation for the pouch. This is in left hand configuration intended to carry cross-draw fashion but also has a belt loop for vertical carry. This new sheath has been created for the popular Brothers of Bushcraft knife from US manufacturer TOPS Knives. It's a scout carry with integrated holder for the firesteel that is supplied with the knife. The sheath has a strong friction fit that allows the knife to be drawn easily without having to release a retaining strap. I usually carry my own knife cross-draw fashion, but I've been testing the Forester back-carry for the last month and I am really pleased with the ease of use andway it handles. I'm hoping to release a dagger style sheath for the ESEE 5 very soon. This initial design has a fire steel holder and a pouch for the larger Fallkniven DC4 sharpening stone. The final version will probably be a modular design to enable other features to be added or removed as desired. I'm hoping to introduce some dagger style sheaths very soon and by coincidence a customer requested a couple for their Fallkniven NL5. The first is a simple type which has a strap secured by a snap fastener. The second is a more elaborate affair with folded pouch and firesteel holder. The customer's choice of dark brown perfectly complements the Idun's stacked leather handle. This custom pouch was made for a small folding knife which a customer picked up on his travels. The knife itself has a locking blade of damascus steel and bone scales with red liners. The pouch was to house the knife and a small DC3 sharpening stone. A moulded pouch was created to fit the contours of the knife and an internal pocket held the stone. Every so often I get a really interesting knife to create a sheath for, like this Fallkniven TK5 Tre Kronor. Small in size but exceptional in quality. The customer requested several sheaths including a Boreal sheath and this pocket/neck sheath (below). The retaining strap is attached with two snap fasteners so can be removed and reversed if required and the lanyard allows it to be carried vertically around the neck. This was an interesting project. A custom Boreal sheath for an ESEE 4 knife. The customer requested my Paleo finish which involves giving the natural leather an aged and weathered look. In addition, it was to have the customer's initials, a removable belt loop for vertical carry and an attachment point for a leg tie. As this is destined to go to Africa the customer made a last minute request for an 'Africa continent' logo on the pouch. I really liked this idea and was only too willing to oblige, although I may have been a bit generous with the proportions of Madagascar! This customer requested a Raptor EDC for their Fallkniven F1 knife together with a matching Prospector pouch, both of which were to be in dark tan. This customer requested a Raptor sheath for his NL3 hunting knife. Whilst the NL3 is an exceptional knife, it's not really suitable for a Raptor so I constructed a Boreal/Raptor hybrid, relocating the firesteel loop to the front. This allowed the belt loops to be repositioned to create better balance when worn horizontally. As with the regular Raptor, this is Molle compatible and can be rebuilt in right or left hand configuration or, at a later date, upgraded to an EDC version should the customer wish to. This customer requested a Raptor sheath for their Fieldcrafter-UK knife. I admit I have not seen these knives before but I really like this model - Scandi grind on 6mm damascus steel stock and green micarta scales - it feels really robust. This Raptor is finished in dark brown with a Sam Browne fastener on the handle retaining strap as per customer instructions. This was to be a two-toned finish with custom tooling. The leather was antiqued to bring out the detail in the dragon-scale effect. The knife is retained by a simple strap and brass snap fastener and a solid brass D ring is used to attach the belt loop.